Welcome to my “He Hunts” blog and thanks for reading. In this blog I’ll be telling stories of my hunts, writing about various hunting and wildlife related topics, and especially how Bobbie Jo and I bring wild game from field to fork. For the recipes and cooking details for wild game, read Bobbie Jo’s “She Cooks” blog and visit the recipes section of ourwebsite. 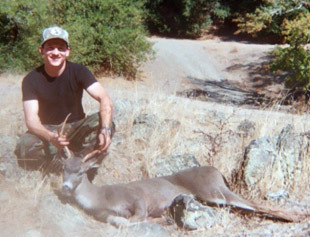 I have always wanted to write about my hunts. Even before I was old enough to get a hunting license I was reading Outdoor Life and Pennsylvania Game News which were full of stories about hunter’s experiences. I saw myself writing similar stories of stalking and shooting 12-point whitetails and filling my game bag with a limit of cotton tailed rabbits. But I soon found that actual hunting is difficult and the successes don’t happen as easily as they seem in the magazine stories, nor as they’re portrayed in today’s hunting TV shows. So I’ll be writing about both the successful hunts and those not so successful. I was really fortunate to have grown up in an area where hunting was a well-accepted lifestyle and have been surrounded by family and friends who hunt. Bobbie Jo and I are from rural Pennsylvania where, at least back in the 70’s, the hunter education classes were held at the elementary school. In early spring local game officials came to the schools to teach the entire 6th grade classof boys and girls hunter’s education and administer the certification test. And every Thanksgiving, our area schoolswould close down the Monday and Tuesday after the holidayfor the first two days of the rifle buck season to allow kids to hunt. The majority of businesses would shut down and employers were fine with many of their employees taking vacation those days. Local stores would run “deer-lonely-ladies” special sales to give the women something to do while the men were hunting. In our hometown the local newspaper continues to publish pictures of hunters with their deer and bear kills during the season. 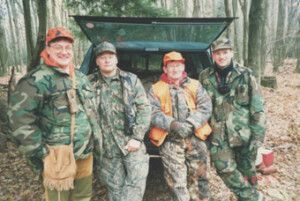 I was also fortunate to have been taught how to hunt by my dad and my brothers. If it had not been for them I may not have taken to this past-time so easily and may have missed out on the fulfilling experiences that I now cherish in this sport and lifestyle. 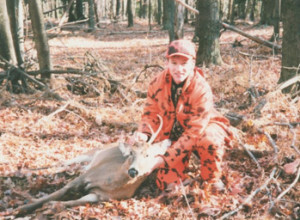 The photo here is a favorite of mine, taken back in the 90’s during a Pennsylvania flintlock deer hunt. That’s me on the right, with my dad John next to me and my brothers Mick and Dave on the left. When you ask a hunter what he enjoys most about hunting, you get various responses. Some hunters talk about enjoying the solitude of being out in the wilderness and new experiences in the field. Others say it’s about the tradition of being with family and friends. Some are after that trophy buck. And some just want a great venison steak on their plate. I plan to write about all of these different views on hunting and my own thoughts as I go on hunts here in California, Pennsylvania, Wyoming and other locations around the country. Since we grew up in the same hometown, Bobbie Jo is familiar with the hunting lifestyle and traditions. This combined with her amazing talent for cooking makes Bobbie Jo a natural for creating delicious dishes from the wild game I bring home. Luckily she isn’t limited to just what I harvest, otherwise we would often go hungry, and she gets various types of game meats from around the world for her Cookin’ Wild personal chef dinners and for our own use. So even though I have yet to shoot a caribou or try my hand at frog gigging, Bobbie has already made wonderful meals of these and other game and exotic meats. My plan is to now go after these types of animals and write about my adventures along the way. But our common interests aren’t limited to just hunting. Living in northern California, we enjoy wine tasting, year-round outdoor activities, and cultural and culinary experiences of the western mountains and west coast cities. In our blogs we’ll be writing about these, as well as those of our hometown and places we visit in between. I’ll also be writing about what it’s like to hunt in California and highlight aspects of hunts here that are unique to the Golden State. Now, I’m well aware there are many more skilled and experienced hunters out there who have hunted more days in the field and who have hunted other game and waterfowl and using methods I haven’t tried. I look to those hunters for inspiration and guidance as this old dog tries to learn some new tricks. 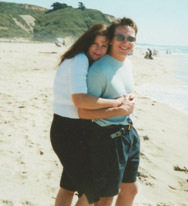 I welcome any of your stories, advice, or even encouragement along the way. My email basket is always open at dan@hehuntsshecooks.com so feel free to contact me with anything you’d like to share regarding our common interest in hunting and the outdoors.